The number of pumpkins that will be sold this year, up 30% on 2010 sales. It's a happy Halloween for the high street. Halloween is giving high street retailers one hell of a boost this year. Sales of witches' hats, ghoulish masks, fake blood and other horrific and gory products are set to stoke up sales by a fiendish 12% to top £280m this year. 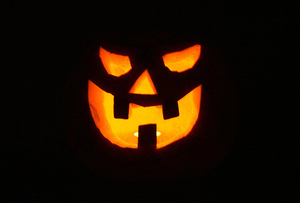 Around one million pumpkins are set to be carved across the UK this week, grinning garishly from windows and doorways. Latest retail data from Asda, which is leading the way in spooky-themed products (devoting whole aisles to the cause) shows that a witch costume is sold every ten seconds. A shocking 2,000 vampire costumes for dogs were also sold online in a single day. Why are the Brits so Halloween crazy? Well, we've been bitten by the buzz over in America apparently. Or, perhaps, amidst all the bad news on the economy front, people are desperately in need of an excuse to party.